There is little doubting the prosperity that the electronics industry has attained over the years but in the past decade, on the back of advent of portable, smaller, and lighter products, the electronic product manufacturers have had plenty of meat to feed-off from. The radical manner in which electronic gadgets such as smartphones and tablets have become ubiquitous, various smaller aspects or segments have gained impetus, including the market for underfill materials. 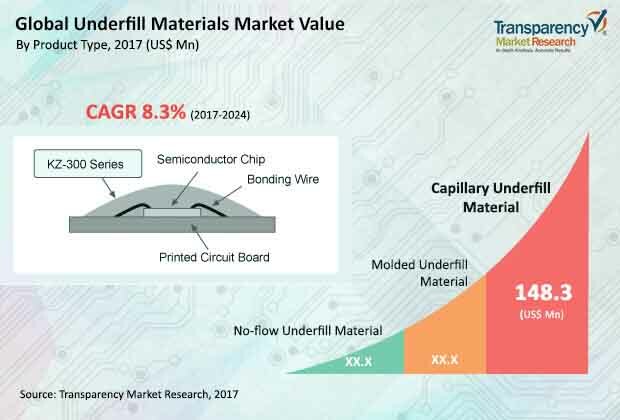 Underfill materials act as a filler in the semiconductor industry to provide increased resistance and achieve strength, and according to this business intelligence study - the demand for the same will be propagating at an impressive CAGR of 8.3% during the forecast period of 2017 to 2024. In terms volume, the global underfill materials market is poised to produce a demand for 847,897 Kg by the end of 2024, substantially more than 495,022 Kg that were required in 2017. Revenue-wise, the global underfill materials market is estimated to be worth US$448.3 mn by 2024. Apart from the escalating demand for handheld electronic products, the underfill material market is also gaining traction from top-upped military budgets of several emerging economies and the flourishing aerospace industry. In both these end use industries, underfill materials are used to impart reliability to portable electronic products and make them capable of withstanding stress. The automotive industry is another opportune end-user for the vendors operating in the underfill materials market, wherein electronic components are now increasingly used and underfill materials enhance the strength of solder joints and thermal cycling board level reliability. Many high-end devices are migrating from wire bond to flip chip bonding in order to leverage the advantages such as board area reduction up to 95%, high speed electrical performance, more durable interconnection, and lower cost for high volume production. This in turn is expected to positively impact the sales volume of underfill materials. On the other hand, factors such as constantly reducing profit margins for underfill suppliers as the end users are seeking lower cost packaging solutions and considerable cost of research and development are a few restraints mitigating the growth of the underfill materials market. That being said, the analyst of the report has highlighted the entrance of new players who are aspiring to carve a niche for them with technology and flip chip packaging of low-k devices are some of the new opportunities in this market. Transition towards cost effective underfill materials and market consolidation by the means of mergers and acquisition are a few trends highlighted and analyzed in this report. Based on product type, the report segments the underfill materials market into molded, no-flow, and capillary. By the end of 2024, the capillary underfill material segment is projected to provide for a revenue of US$279.3 mn. The benefits such as improved process-ability, lower stress, and enhanced reliability are some of the key factors driving the adoption of capillary underfill material segment. Application-wise, this market has been bifurcated into ball grid array, flip chips, and chip scale packaging. As of 2017, flip chips was the in-demand segment and is primed to provide for a revenue of US$243.3 mn by the end of 2024. Geographically, over the course of the forecast period, the region of Asia Pacific is anticipated to showcase most robust growth and the demand is estimated to expand at an impressive CAGR of 9.7% in terms of revenue during the forecast period of 2017 to 2024. By the end of 2024, the Asia Pacific underfill materials market is projected to be worth US$319.8 mn. The development of Asia Pacific market for underfill material is expected to be driven chiefly due to the high adoption of these materials in industries based out out of China. Other regions such as North America and Europe are expected to show great demand for underfill materials over the coming years. Henkel, NAMICS Corporation, Nordson Corporation, H.B Fuller, and Epoxy Technology Inc. are a few key companies in the global underfill materials market. Underfill materials are necessary composite formulations made of organic polymers and inorganic fillers. These materials find their application in packaging of semiconductor for enhancing their thermochemical performance. Underfill materials are being excessively used in the packaging of semiconductor packaging because of their outstanding rework ability and thermal stability. The global market for underfill market could be segmented in terms of the different product types, application, and region. Such in depth and decisive market segmentation of the global underfill material market provided by the report aids in understating the overall growth prospects and the future outlook of the different segments of the market and thus, helping the potential buyers to make informed decisions while investing in the market. The report on underfill material market offers the analysis and forecast on regional as well as global level. It offers historical data of the year 2015 and 2016 along with the anticipated data of 2017, and a forecast data up to year 2024 in terms of volume and revenue. The report also offers key driving and restraining factors for the growth of the global underfill materials market and their effect on every region over the course of the given forecast period. The research report on the global market for underfill materials offers crucial growth prospects and prominent trends and opportunities that may come up in the market over the course of the given forecast period. The research report is the result of in-depth and extensive primary as well as secondary research methodologies backed by crucial market insights offered by the industry professionals. The report on the global underfill material market also gives valuable information of end users and suppliers. In terms of geographical segmentation, the global underfill materials market can be segmented into key regions such as Latin America, Asia Pacific, the Middle East and Africa, Europe, and North America. Over the course of the forecast period, the Asia Pacific market for underfill materials market is expected to show most promising growth rate. The U.S., Germany, France, China, and India have been identified as some of the key countries for the vendors operating in this market. Some of the key players in the global underfills materials market include names such as Yincae Advanced Material LLC, AIM Metals & Alloys LP, Won Chemicals Co. Ltd., and Epoxy Technology among others.